The use of Preimplantation Genetic Testing (PGD) enables fertility doctors to screen embryos for genetic diseases such as Cystic Fibrosis or Sickle Cell Anemia, permitting couples at high risk to avoid transmitting these diseases onto their children. 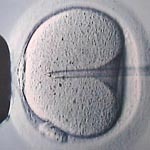 PGD is done as part of an IVF cycle. 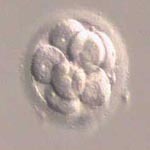 A biopsy is taken when the embryo reaches the 8 cell or the blastocyst stage, and tested for the specific gene we are concerned about. This same technology can also be used to test for genes that do not necessarily cause a disease but put an individual at risk for other serious diseases. One such genetic mutation, called the BRCA 1 and 2 gene, puts affected women at very high risk for developing breast and ovarian cancer. The risk of developing these cancers in affected women is so high that many women (such as Angelina Jolie) chose to have their breasts and/or ovaries surgically removed just to prevent cancer. Since we know the genetic sequence of the BRCA mutation, it is possible to screen embryos for it, and prevent transmitting the gene onto one's daughters. This article in the Wall Street Journal tells the story of a family who decided to go that route.